Welcome back to the list Mr. Cron! The younger brother of C.J., and all-around masher put together a week of 5 homers, 15 RBI, and a deadly slash-line. Here we have another big first baseman putting up BIGGER numbers this week to take home the trophy for his team. All 5 of his home runs this week came in just 2 games, including a 3 HR performance against the Salt Lake Bees. Interestingly enough those three big flies were hit off of three different pitchers on that one day. Cron was able to achieve the baseball version of a hat trick, and it helped him bring home Prospect of the Week honors for the second time this season. How locked in is #Dbacks No. 19 prospect Kevin Cron (@kevin_cron24) for @Aces? He had to be reminded this was the last day of June. It is refreshing to be able to highlight a positive Kopech performance for one of the first times this year. The hyped right-handed fireballer finally got around to playing up to all of the hullaballoo. You never love to see 6 walks in 2 starts or a loss, but 16 strikeouts and 13% SwStr% showcase everything fantastic about Kopech as a prospect. Let’s hope this is the beginning of a stretch that allows him to pop-up on this list a few more times by the end of the year, and possibly up with the White Sox at some point. Phillips has been up and down to the major leagues twice this week, but yet to make his MLB debut. It is the week of the first baseman over here on Prospects1500. As you scroll down this list, you will find a plethora of large, right-side infielders hitting for massive power. Bradley is easily the most well-known in prospect circles at the moment. This week’s performance was impressive, and on the year he is mashing regardless of the low batting average. The strikeout rate will always be a bit poor, but he has a way of making up for it by doing things like hitting 16 homers over his first 71 games. Bradley is creeping back up to earth with his batting average finally eclipsing .200 after this week’s heat. 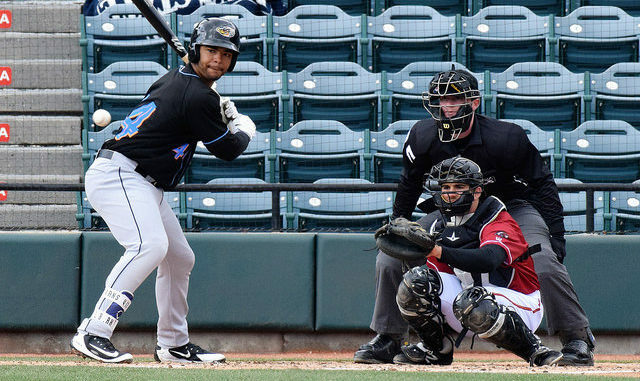 Akron Rubberducks (1B) Bobby Bradley now has 6 HR’s out of his last 10 games: Bradley’s HR tonight ties him for the Eastern League lead with (16) on the season. Another New York Yankees pitching prospect performing in the minors. King is one more in a line of unknown, underrated arms that can move a fastball around the zone at mid-90s velocity with a decent breaker and a developing changeup. This week he was able to piece everything together for a complete game shutout that included 11 strikeouts and no walks whatsoever. He is beginning to creep closer and closer to the major league level but still hasn’t made a real name for himself within the system. More weeks like this will see the sinker-baller rising into the Yankees hype machine in no time. Sheets displayed his natural hitting abilities this week with this beautiful performance. He was able to accumulate a massive 16 hits over the course of only 7 games with 2 homers, a stolen base, and a host of help for the Winston-Salem Dash. It would be something special if the future 1st baseman started to hit for a bit more power, but the plate discipline has been nearly elite. This week was all about swinging the bat and showing off a whole bunch of barreling skills. Sheets’ bat is one of the more intriguing at this level as a 2017 draft pick, and it will be exciting to see him move up through the system to test those tools. He’s on a 15-game hitting streak & has six (!!) straight multi-hit games. Rosso continues to put up an interesting season. His Sally stats upon promotion were a 1.33 ERA, 0.96 WHIP and 81:20 K:BB in 67.2 IP. He surprised a lot of people following the Phillies system. The 22-year-old threw his first start for the Threshers this week and had no problems with the adjustment. He was able to rack up 9 K in 6 IP to go along with only 2 hits and 1 walk. Rosso doesn’t bring much velocity or bite to the table, but just enough to make people worry about what pitch is coming next. The fastball has some cut in on right-handers and fades off the plate to lefties. He’s a big arm that’s finally moving up the ranks to see if his fastball/slider repertoire will hold at the higher levels. If this week is any sign of what’s to come, I’m on board. Yankees LHP Phillip Diehl is straight nasty. FB at 93 has life, CB at 81 is sharp and thrown with confidence. Not afraid to challenge hitters inside. He needs to be in AA. Duran is a little catcher with a big bat that displayed a ton of barrel ability this week. The 20-year-old, listed at 5’9″, 181 lbs., mashed 3 homers to go along with a ridiculous slash-line that included a .737 OBP in 5 games. Duran’s electric hands and incredible bat speed coming out of the Dominican Republic are finally developing into more power this season. This week was not the first in which he has shown more muscle. The young catcher now has 11 HR on the year. He is a short, scrappy gamer that needs a bit more attention, and where else do you go for those types of players than our piece of course!! Shaffer continues to dazzle with an incredible command to start his professional career. So far in 2018, he had 18 BB in 15 starts after only 1 BB in his debut 24 IP last season. This week was no different as Shaffer allowed zero free passes compared to 14 K and only 1 ER. The properly built right-hander was a big name in college and has not given any reason to doubt his talents in the majors thus far. His mid-90s fastball, command, and breaking ball were all on point this week to give him the award he so well-deserved. Terry is a BIG prospect with massive raw power, which was on display this week. The 21-year-old mashed 4 homers and 10 RBI in only 6 games. The 2017 Home Run Derby champion showcased exactly why his bat is so coveted. His profile still leaves one worrying about the strikeouts and lack of walks, but the muscle is all there. This week’s performance is an example of a low-level prospect catapulting onto people’s radars by producing what was perceived as only raw ability. The more he shows this in the game, the more Curtis Terry will become a household name. Oviedo made a big impression this week in his third start above rookie ball. The 19-year-old Venezuelan product harnessed the raw tools within his 6’4″ frame and tossed 6 shutout innings. He had no problem spinning the breaker this week when judging by the 12 strikeouts and 19% SwStr%. Oviedo has a decent fastball and a curveball/slider combination that devastates hitters when it’s on like it was the last start. This young international prospect is one to keep an eye on as he works his way through the ranks after two seasons of rookie league. The large high school product out of Bedford, NH took no time assimilating to professional baseball. The Colorado Rockies 2018 draft pick blasted 3 homers, 2 doubles, and even stole a base this week even though he the listed frame is 6’4″, 220 lbs. This power display included a 3-run-homer on Sunday which was part of a 5 RBI day for Lavigne. He is extremely intriguing as a prospect, especially after the performance this week. Look forward to more gaudy power pops from this youngster. Despite taking two losses, Martinez did more than enough to achieve Prospect of the Week status. All he did was strike out 19 batters in 9 innings. If that wasn’t enough, he had batters swinging and missing nearly one-third of the time. It was truly dominant to see this 21-year-old obliterating his opponents in rookie ball. It will be very intriguing to follow this prospect as he moves up the ranks and accumulates more minor league sample. These were 9 of his first 11 innings of professional baseball, so the sky is the limit as far as I’m concerned. Marcelo Martinez allowed two hits and one run in five innings for the @BRoyalsKC tonight. Struck out 12, walked none. Find him on Twitter @jeffhyde and Instagram @milbgrammer.